Signs along Adams Avenue in San Diego’s Normal Heights neighborhood mark an area known as Antique Row. However, due to gentrification, the street has gone from hosting over 25 antique stores in its heyday to just one today. In the age of Etsy and eBay, antique stores will likely populate shopping districts less than in the past, but there is still one place old-school antique buyers can go and browse through aisles of vintage treasures –– La Mesa. 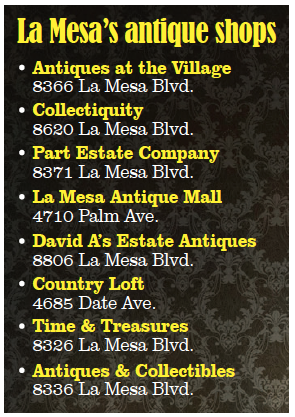 As of now, there are eight antique stores in La Mesa, most of them on La Mesa Boulevard and located near the Village. 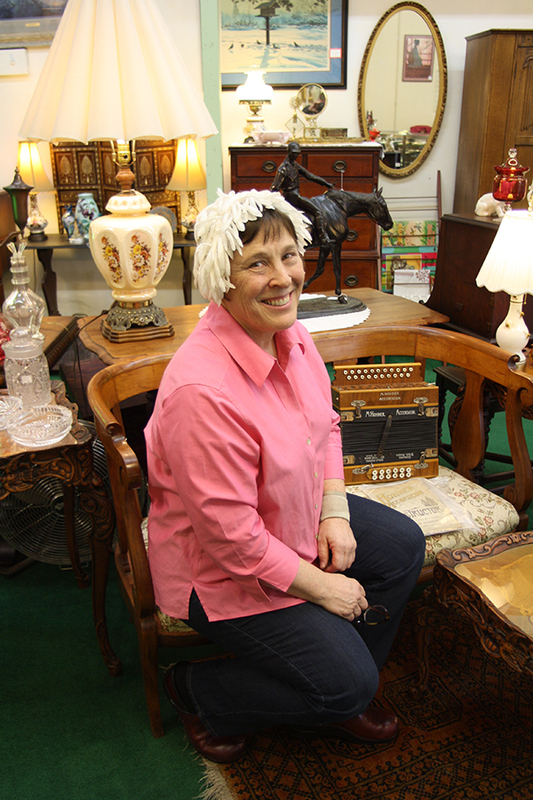 Antique Mall owner Marie McLaughlin sits amongsome of the many vintage items in her store. 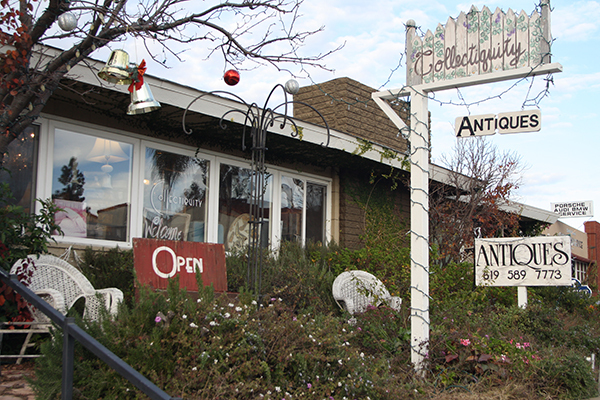 Frances Settle, co-owner of Antiques at the Village, said La Mesa’s small-town charm makes it an ideal place to attract antique shoppers. “We’re just a little slice of America here and it’s the only little village left in Southern California,” she said, adding that antique collectors often come to La Mesa because of the concentration of shops. Settle joined Antiques at the Village in 1998 and credits the store’s staying power to its location and a landlord who sees the value in keeping happy tenants. She also loves the convenience of operating a business in La Mesa. The retail hours of 10 a.m. to 5 p.m. in the Village allow the shop to operate without having to hire extra help. “For a mom-and-pop, you got to have that, otherwise you work yourself to death,” she said. The rising cost of rent for retail space is one of the main reasons that districts like Adams Avenue’s Antique Row have seen stores closed and replaced by more lucrative businesses like restaurants, pubs and salons. 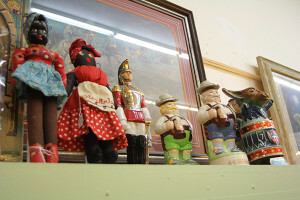 “Property values are a little bit more affordable here than in San Diego,” said Marie McLaughlin, owner of Antique Mall, a large antique center that houses 40 spaces for dealers to set up unique displays of merchandise. Although rent is cheaper in La Mesa, McLaughlin said it has still doubled in the last 10 years. Another challenge for antique shops is the changing value of vintage items due to changing tastes of buyers. McLaughlin pointed to items like collectible ceramic figurines called Hummels that are worth “hundreds less” now. Other items she’s seen a drop in demand for include vintage cookie jars, salt-and-pepper shakers, and other household items. But there are some hot items that are always in demand. “I place ads on Craigslist and all they want are the toys,” she said. When it comes to online sales, McLaughlin puts a few items up on eBay, but prefers to stay old-school and sell her antiques in the store. Not all stores are averse to utilizing online retail services to sell antiques. Michael Moore of Park Estate Co. said the Internet is just beginning to shake up how the antique business is done. Park Estate is already adapting and does “a tremendous amount” of online sales, Moore said. La Mesa’s demographics also give the retailer a more traditional boost to sales. Arlene Moore, Michael’s wife and co-owner of Park Estate, is the president of the Village Merchants Association and a co-founder of the La Mesa Village Antique Street Faire. She and Kathy Snowden — who owned Finders Keepers in the building where Park Estates now resides — started the street fair in 2004 as a way to promote the city’s antique stores. The fair hosts around 100 dealer booths and offers free appraisal clinics for people to learn about the value of their antiques. 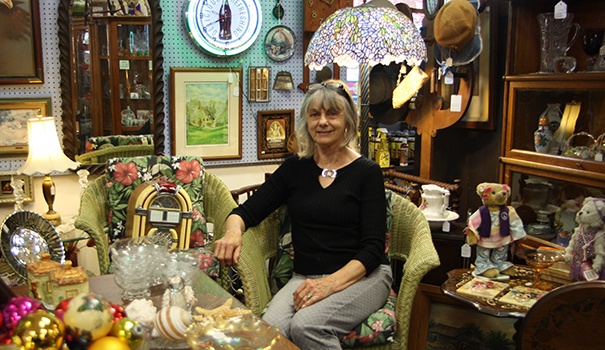 That people need and want expert advice about antiques is the reason Arlene Moore sees antique stores as permanent fixtures along La Mesa Boulevard and shopping districts like it. ––Write to Jeff Clemetson at jeff@sdcnn.com. Been to Marie’s shop and she and her husband Gary do a great job of keeping it stocked in treasures, collectibles, and antique furniture. It’s a family business and their son, Justin, also chips in and helps. Great to see it written up after all the years they’ve been in business! I’ve always been intrigued by antiques & I have recently been getting into dealing with antiques alot more. So I’ll tell you this, I’ve never bought anything online ,& I don’t ever plan to, & quite honestly wish it were never invented! But that’s just my opinion.With that being said, I support all of the antique stores in LaMesa,and so I hope this encourages people to go check out the awesome & unique stores here, and keep the businesses alive.